You do not need a third-party app or anything like that to unhide the game; all you need to do is fire-up a command, and it will activate the game for you. 1. Launch a conversation with a friend you would like to play the game with. 2. When the conversation panel opens, send them a message that says “@fbchess play” (without quotes), and the game of chess will begin. 3. As soon as you send the above message to your friend, the conversation window will immediately show you the chess board to play the game. It will also tell you whose move it is; making a move is not as difficult as you may think. For instance, if you wish to move the Queen, simply use the letter Q, and the tile where you want to move it to. To move the Queen to B4 tile, use the following command: " @fbchess Qb4 "
Similarly, you can move the other pieces you wish by using the first letter of the piece’s name and the location of the tile you want to move them to. If you would like to maximize the chess board, then you can do so by clicking on the Settings icon in the chat window and selecting the “See Full Conversation” option. That should help you get a little larger view of the game. 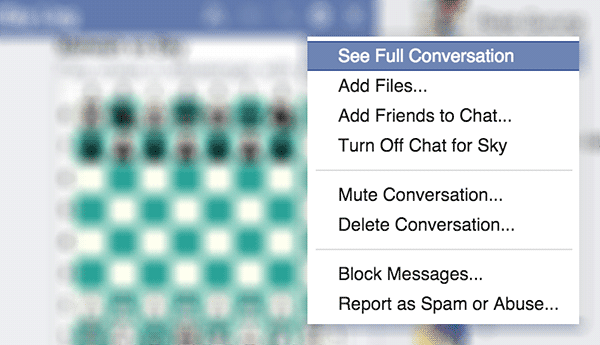 While many of us may not be experts in making a chess move, Facebook also helps you with that by letting you view the full information about how you can make a move. You can get access to that helpful information by typing in the command “@fbchess help” (again, without quotes), and that should show you all the related information about the secret game you are playing.